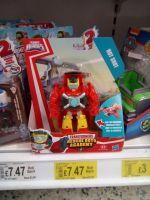 Home » Rescue Bots » Transformers: Rescue Bots Academy Hot Shot Found At UK retail. 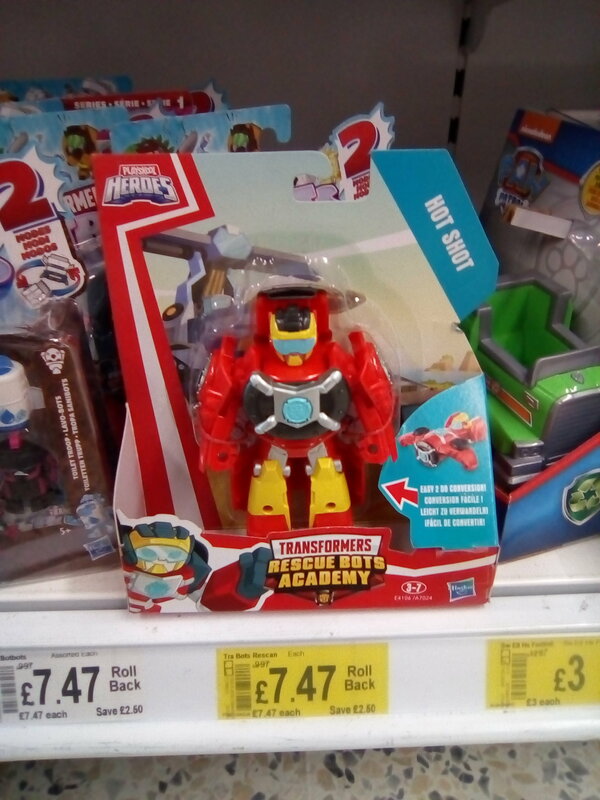 Courtesy of 2005 Boards member Underlord we can report that the new Transformers: Rescue Bots Academy Hot Shot has been found At UK retail. Rescue Bots Academy Hot Shot is a simple and fun figure great for kids. He transforms into a small jet. It was spotted at ASDA in Clacton for £7.49 ($8.46 approximately). Wedge is also in the assortments – I've seen him too in ASDA & also previously in Moons in Newmarket Suffolk a week or two back which I reported at the time. As for Hotshot he's not bad – a moving head would have been nice though. He does unusually have arms that can raise the Quin-jet like moulds are one of the few ones that seems to have this feature. We should be getting the Hovercraft mode too before to long. I noticed that the Multi-pack for Academy is listed for UK release in August – so hopefully it won't be to much of a chore to get the Buggy Hotshot in that set. One would think they'd want to repack Hoist too since he's part of the main cast. My dude…it's Rescue Bots, not Generations. This is literally for pre-schoolers.